Quinoa and Corn Salad Recipe On being nice to jerks. I stumbled across this recipe somewhere online, and made them once as an experiment; they are so good, there were none leftover that evening, and I’ve been making them as a apres-ski snack or as an accompaniment to my Hearty Ham and Bean Soup. In a large bowl, sift togetherÂ flour, salt and baking powder. Cut in butter until mixture resembles coarseÂ crumbs. Make a well in the center of flour mixture. Add the milk and cheddarÂ cheese; stir to combine. Drop batter by spoonfuls onto an ungreased bakingÂ sheet. Bake Â for 12-15 minutes, until lightly browned. 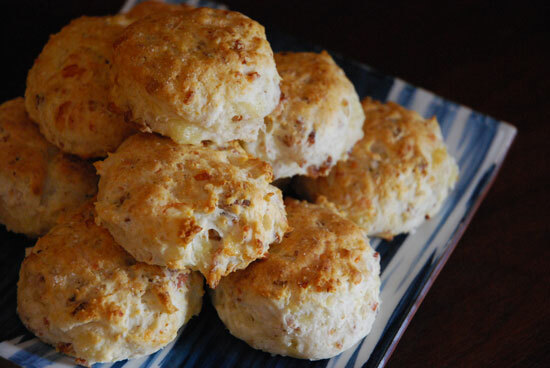 While biscuits are baking mix melted butter and minced garlic. Spoon garlic butter over hot baked biscuits. Jane Kennedy forwarded your e-mail to me so that I could have the recipe for the garlic cheddar biscuits. Just to let you know I have used a number of the other recipes so it you ever update your website with new ones I would enjoy of copy so that I could check out any additional ones that you add.